Generale Kaart van Spanjen. / Le Royaume D'Espagne avec ses Confins. A stunning map of Spain and Portugal first drawn by Daniel de la Feuille in 1706. 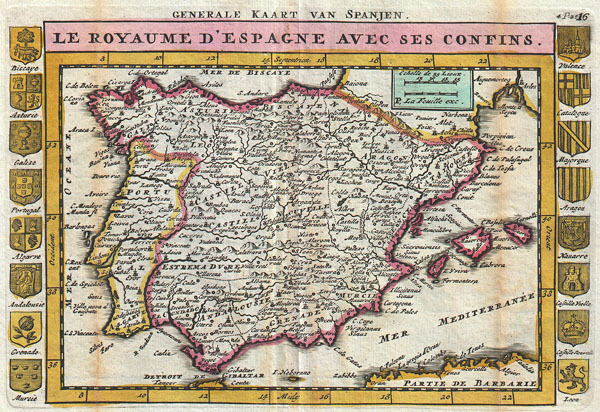 Depicts the entirety of Iberia including the Balearic Islands, parts of France, and northern Africa. Surrounded on either side by the armorial crests of 16 Spanish regions. Title at top of map in French and, outside the margin, in Dutch. This is Paul de la Feuille's 1747 reissue of his father Daniel's 1706 map. Prepared for issue as plate no. 18 in J. Ratelband's 1747 Geographisch-Toneel.